If you follow me on social media then you might have seen me mention a homeschooling linky that I was starting with three of my fellow homeschooling blogger pals, Adele, Laura and Polly. Mr C and I finally made the decision to home educate about six months ago (I wrote about some of the reasons for our choice here) after thinking about it for years and since then just keep becoming more and more sure that it’s the right choice for our family. I know we will face many challenges along the way but I’m sure that would be the case no matter what schooling option we chose. We started this linky because we thought it would be a nice way to learn more about the different ways people homeschool as well as discovering some new blogs to read along the way and hopefully even picking up some new ideas from each other. It will hopefully be a useful resource for people who are interested in home educating but have no idea what it involves or how to go about it. To join in you just need to link up a post about a week, day or even just a moment from your homeschooling life. I’m going to be sharing what we did this week, starting from Tuesday as Monday was a bank holiday and we were at a car show. We’ve been attending home ed groups and meet ups since before the summer but now Cherry would have started school I’m getting stuck into finding groups that we can attend on a regular basis as well as planning lots more things to do at home. We are taking more of an ‘unschooling’ approach to things and Cherry leads the way in what she wants to do but I am trying to introduce her to lots of things so she can find what it is that she’s interested in. So on Tuesday we started the day with a trip to the park. I’ve generally avoided them throughout the holidays as I find them too busy so it was nice to find only the younger kids there again. There is a big open space and skate park there too so the kids got their bikes out. Then in the afternoon we went on a nature hunt. 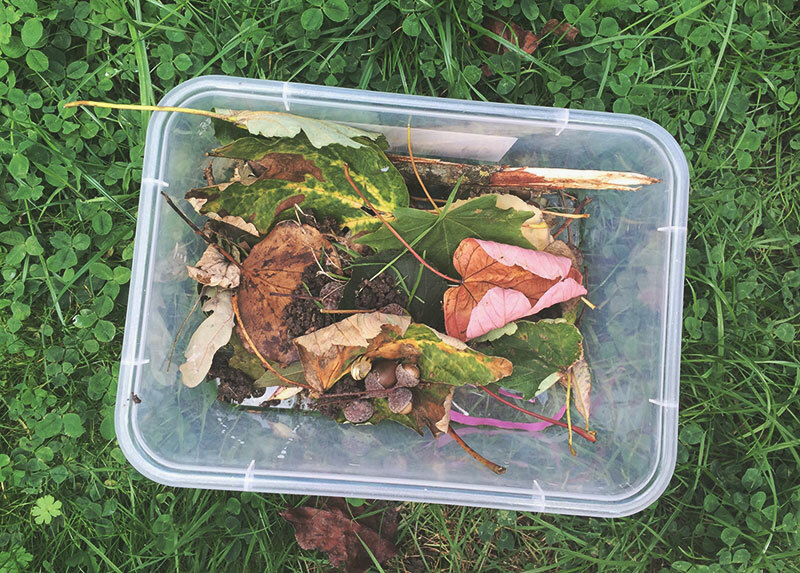 The kids took a box with them and filled it up with leaves, bark, acorns and the one tiny conker that they found, we are going to go back in a few weeks as it was a bit early. When we got home and they drew around the leaves and we learnt about the different names of the trees. Cherry wrote the words of the trees on a piece of paper and drew the acorns / conkers. Afterwards they took their boxes outside and collected up some bugs to put in them. On Wednesday we baked a banana cake, using maple syrup instead of sugar. Cherry helped by mashing up the bananas and stirring it. Then Cherry did some sums using pieces of cut up straws to help her work out the answers. I wrote the sums on one sheet of paper then used another sheet with a space either side and a plus sign for her to put the same number of straws. She then counted them all up and wrote the answer. Then in the afternoon we had a boring trip to the supermarket made a bit more fun by a walk into town to go to the park and feed the ducks. On Thursday we headed out to a ‘Not Back To School’ party at a home education group held in a village hall. This was our first time but we are going to start attending every week as the kids absolutely loved it. There is a skate park, huge open space to run around in then at the end there is a big park with a zip wire. Inside they have toys and different activities set up each week. As it was a party this week they had bouncy castles and fete games. There was also a little girl painting everyone’s faces with her mum. It was so nice to see all the different ages interacting and playing together. We were actually there with one of the the hosts of this linky, Adele, as it was in-between where we both live. Cherry gets on really well with her little girl, Talitha and they’ve known each other for most of their lives which is really nice. Then on Friday we had a really exciting day as we drove down to a place called Tyneham Village for a home ed visit. I have a separate blog post coming up about it as it was such an interesting place but if you haven’t heard of it then it’s a small coastal village where time stopped in 1943 after families were asking to leave in order for the area to be used for D-Day preparations. They were under the impression that they would be coming back but that was never the case. It’s owned by the Ministry of Defense these days and the public are only allowed in and specific times. There was only about five families in our group and we had it all to ourselves which was awesome. So that was our week, we are trying to make the most of the weather by doing lots of outdoors things before it gets really cold. I’m not looking forward to the winter very much at all, the kids don’t mind at all but I really struggle with the cold.